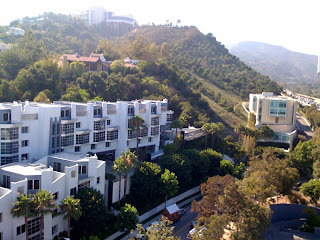 This is the view from the Hotel Angeleno, 170 N Church Lane, Los Angeles, California 90040. Jay's small home can be seen between the trees on the street. The Getty Center buildings can be seen on the right and on the hill in the distance. The Museum Heights Condos are on the left. We are making arrangements for the weekend workshops. We're behind schedule for our 5:00 PM open house. We should arrive by 5:45 or 6:00 PM.